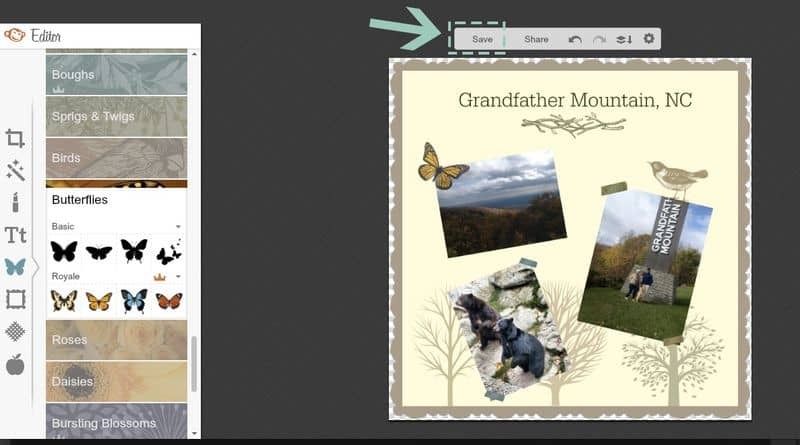 Log into your Spoonflower account, and hover your mouse over the “CREATE” menu tab. 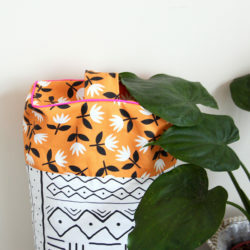 Click on “custom fabric.” Don't have a Spoonflower account yet? 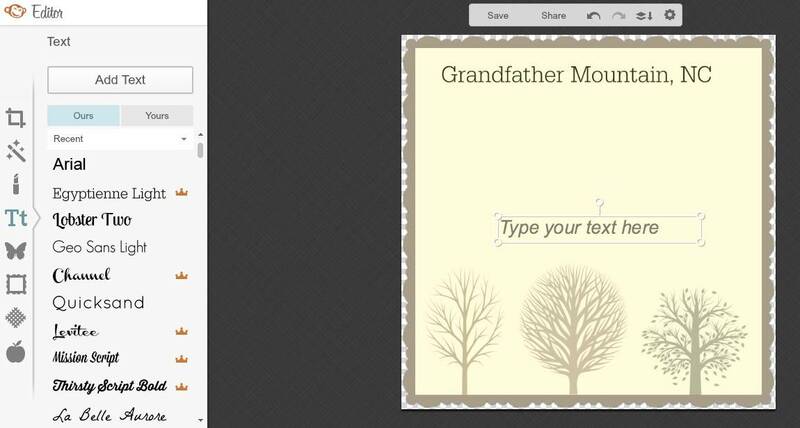 Create one here (it's quick, and it's free!). 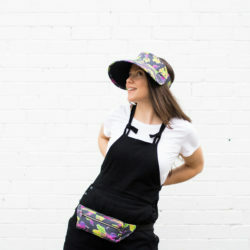 Scroll down to the “Upload your fabric design” page, and click on the gray “SWATCH” button below. This will open PicMonkey. We’re starting off with a blank 8×8 inch canvas. 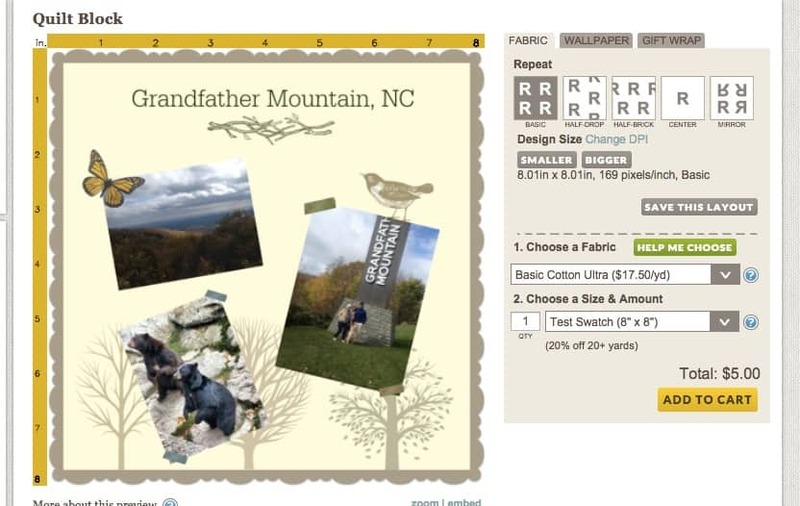 I want to make a quilt block with a few photos from a family trip to Grandfather Mountain that we took a couple of years ago. It’s so gorgeous up there! Before we go any further, let’s take a look at important buttons so you know where to add text, photos, and nifty clip art to your quilt block. As shown in the screen-shot above, I used the text tool to add text to my image. Picmonkey has an excellent library of great fonts to choose from. You can shrink/enlarge your text or change the color. If you want to learn more about creating text-based designs in Picmonkey, check out this great tutorial. Feel free to play around and experiment! Next, I used the overlay tool (butterfly shaped button). The great thing about the overlay tool is that you can use Picmonkey's extensive library of clip art or upload and use your very own photos from your computer. 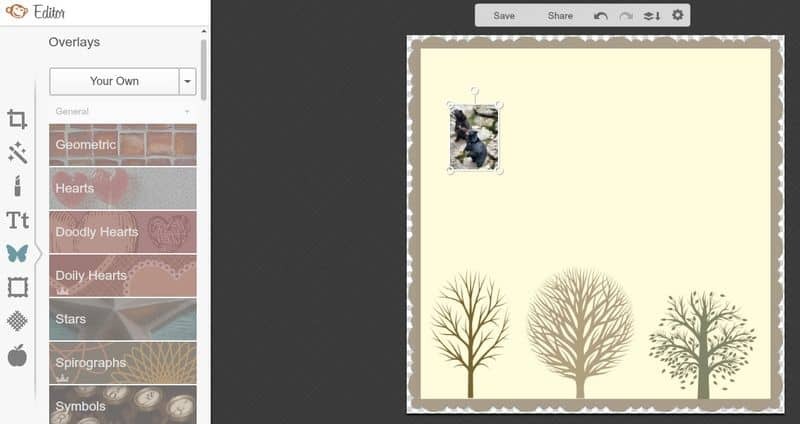 I'm using both my own images, and also some lovely nature clip art from Picmonkey. 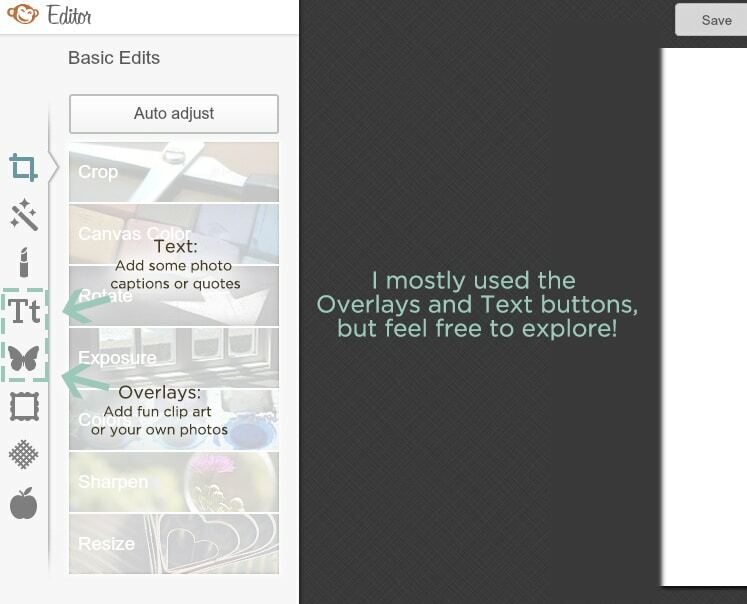 I mostly used the Overlay section to add photos and cute icons to my canvas. Here are a few screenshots to show you the work in progress. 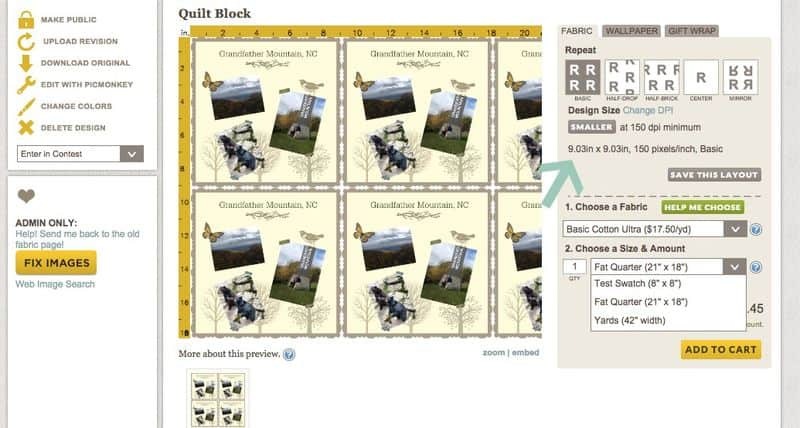 When you’re all done with your quilt block design, click on the “Save” button at the top of the page. 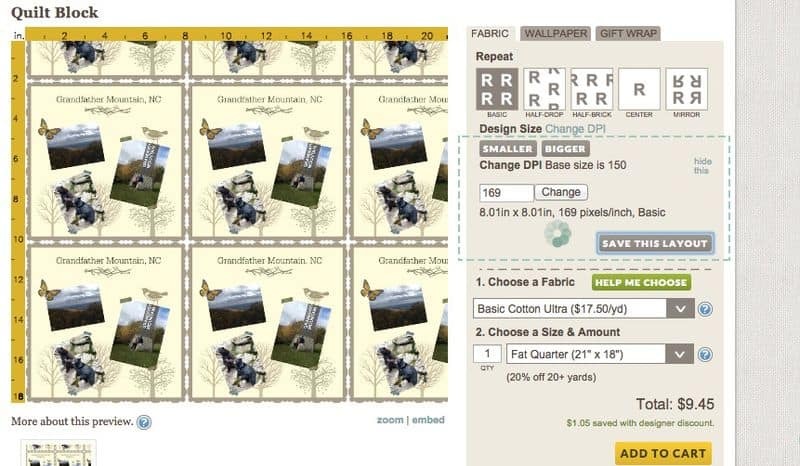 PicMonkey will close, and your design will appear in your Spoonflower account. 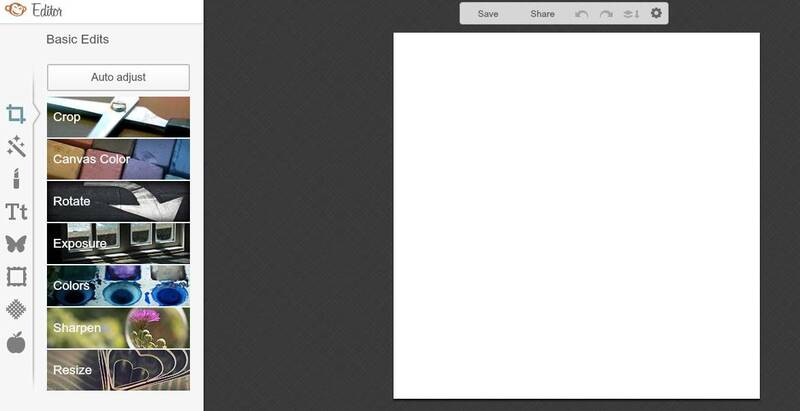 Take a look at your design in the preview window, just to make sure everything is ok. I noticed that my design turned out to be 9×9 inches, so I adjusted the size using the “Smaller” button and then clicked “Save This Layout.” I want to make sure nothing gets cut off by mistake! Now we're ready to order our fabulous new quilt block! Verify that your blocks look exactly how you envisioned, and add a swatch to your cart. You can repeat these steps to make a variety of quilt blocks, with or without photos, or even create custom quilt labels for your finished project. 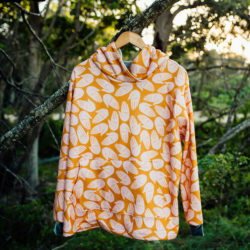 Spoonflower offers a variety of quilt-worthy fabrics. 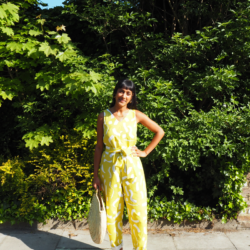 Click here for a fabric list and prices per yard. Happy designing one-of-a kind quilt blocks for your family and friends!